The following represents the most unusual interview I’ve ever given. 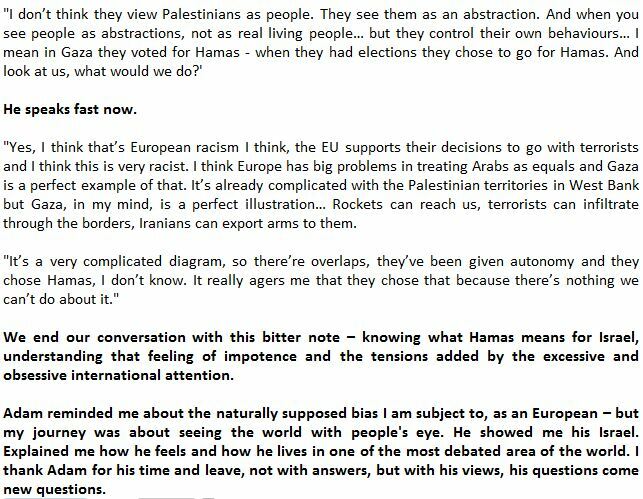 While the bulk of the questions themselves were not especially unusual (which included topics such as Zionism, my life in Israel, and Judaism), the methodology employed by my interviewer, Patrizia Bertini (A PhD student at LSE) was, as you’ll see, a bit, let’s just say, experimental. Note that the free wheeling, unstructured nature of some of my answers reflect the unorthodox (though quite interesting) nature of Ms. Bertini’s questions. 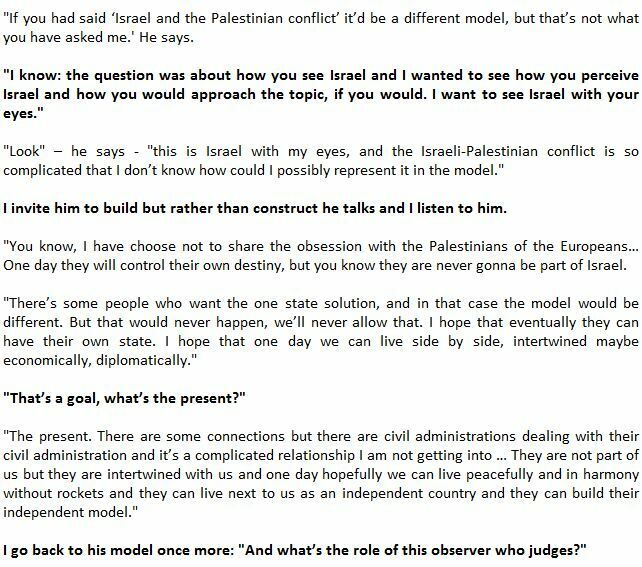 I’ll post the interview from the journal as screen shots to provide an accurate sense of the method employed. One final note: The London Progressive Journal, where the interview was published, is very far left. To Ms. Bertini’s credit, her quite politically charged questions were asked very respectfully, without bias, and published by LPJ largely unedited. You probably didn’t notice this adam, but you chose a green flag. The green flag is the colour of Islam. Or Ben Gurion’s dream for the Negev. Or a link to the Irish will to get the Brits out, which was shared by the Irgun and other pre Israel factions. Great fun way to conduct an interview, and a mature attitude to people’s views. I agree – it was very refreshing to read an article by an interviewer who clearly has her own views, but set them aside so as to more clearly hear the views of the interviewee. 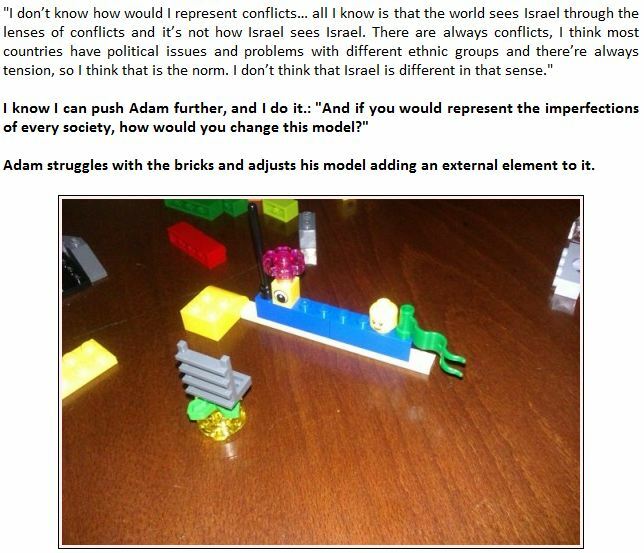 I’m sure the lego challenge made you think in new ways too, Adam. Interesting. I didn’t notice the color. I’m quite artistically challenged. Gee… the London Progressive Gazette! 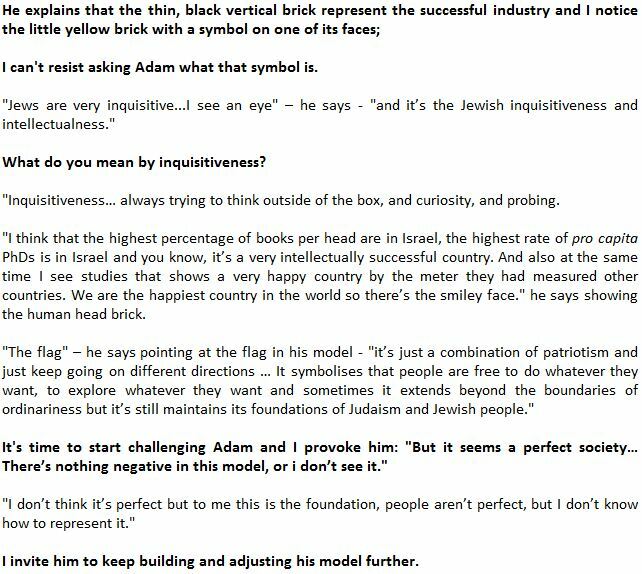 Benyamin do you mean Adam has been interviewed by another publication? Or do you have a problem distinguishing between the words ‘Journal’ and ‘Gazette’? Trickery worth mentioning: You describe European racists as engaging in “soft colonialism, soft imperialism” with an “obsession”, but the headline uses these terms to refer to you. It’s all in where the editor placed the apostrophe. I wonder how many readers will notice. Also, be aware that “Israeli-Palestinian conflict” is a Second Intifadah propaganda term that disassociates the Jews from their homeland and minimizes the size of the alliance at war against the Jews. I recommend against using it in the future. Imagine you are a little kid named Gaza at school and another boy named Israel bullies you everyday. Israel is constantly stealing Gaza’s lunch money, tripping him in the hallway and throwing stones at him in the yard. Gaza goes around telling teachers and his parents that Israel is bullying him. No one does anything. This goes on for decades. Imagine if Gaza gets fed up with all the abuse and one day starts fighting back. Imagine what the cluesless MSM-fed adults around these two boys might say to Gaza complaints: well you did bad things too, or grow up, or I don’t have time to find out what is the truth here so you both get a punishment. Well, it might be that you’re ignorant, or mendacious, or just a total idiot. The problem could be any of those–or more likely, a combination of all three. 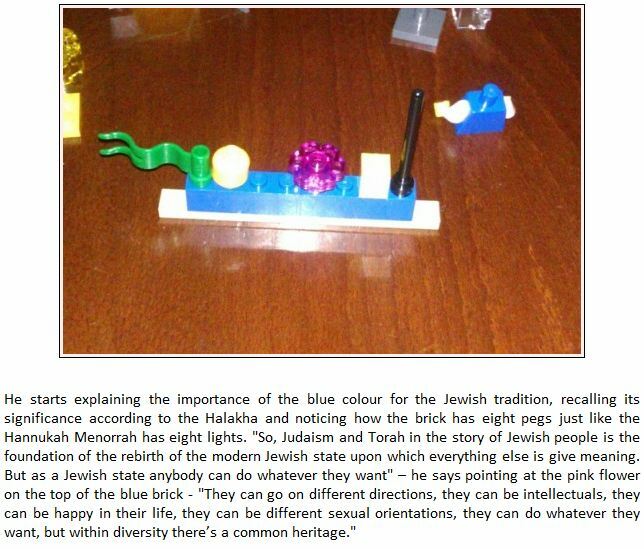 You have neatly encapuslated the stupidity, blindness and casual racism of the anti-semitic left in only a few words. Is the journal too progressive to hire an editor? Thank you Adam for this, I appreciate it. Tangaroa – no, there’s no malicious intention in the title and I have just realised the subtle distinction. Thank you for pointing this out – very constructive and useful comment. 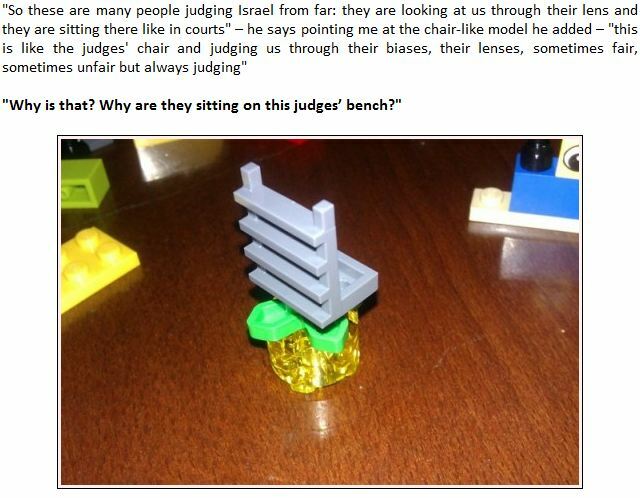 I’ll change it straight forward on the Legoviews.com blog and pass this on to LPJ. GoonerEll ~ regardless where I’ve published this interview, the truth is that my opinion is much more complex than the simplistic one that could be generically attributed to progressist left wings’ publications – my interest is not imposing my view, but listen to others view, give voice to others, to learn, understand and stimulate debates and thinking. I don’t like the propaganda-like journalism, I rather believe in the importance of listening to others’ opinions as a mean to engage people to reflect on their positions and develop their ideas. Thanks for a fascinating interview, Pat! You have made it fascinating… this kind of interviews require the interviwee to engage in the process and construct their ideas through a different cognitive excercise. Steve bronfman – The version on Legoviews.com is edited. Likely it will be adjusted also on LPJ.